The Jordan natives are extremely proud of two of their attractions. One is natural and refers to the area of pine forests - Ajloun -Dibbine, and the other is the embodiment of the Arab genius of engineering and architectural built during the Middle Ages, which is reflected in the impressive Fortress Ajloun . Fortress Ajloun dominates the eponymous Jordan city and its hill named Jabal Auf. Castle Ajloun has long been known as Rabadi because of the family which inhabit this Islamic palace in northern Jordan. Fortress Ajloun stands about 80 kilometers north of the capital of Jordan - Amman. The medieval fortress was raised on a high hill in 1184 by one of the generals. The main purpose of the fortress was to control the iron mine in Ajloun and to prevent incursions of the Franks at the time. Elevation upon which the fortress was built was strategically chosen. The castle dominates the three main roads leading to the Jordan valley, through which provided control and protection of trade routes between Jordan and Syria. Castle Ajloun turns into one of the biggest nightmares of the Crusaders. The knights spent decades in an unsuccessful attempt to subdue the fortress and failed to succeeded. In 1214-1215, the castle Ajloun was re-constructed during the reign of Aybak bin Abdullah. In 1260, however, the fortress was conquered by the Mongols, but later they were exonerated by the Egyptian Mamluks. After that time the fortress Ajloun was no longer required as a fort and began to be used as an administrative centre responsible to Damascus. Castle Ajloun is one of the best examples of medieval Arab and Islamic architecture. It was built as a rectangle with four square towers and an entrance on the south side, dominating over the wide area from the north of the Jordan Valley. One curious fact is that some of the rocks from which the monastery was built has carved crosses. A story still exists from the 13th century, that once the site of the fortress was a monastery where monks lived. It was after the monastery that the castle took it’s place and it’s name. The area of the fortress Ajloun is very beautiful and naturally diverse. 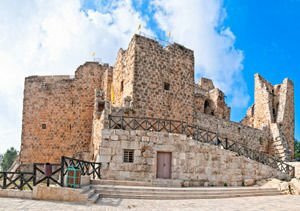 To reach the castle you'll have to go through pleasant pine and olive groves, mills, picturesque villages and the rolling hills of northern Jordan. Close by is the Ajloun reserve, covering an area of 13 square kilometers.